What do the University of Missouri, the State of California and Apple Inc. have in common? They are three of the Environmental Protection Agency’s top 30 on-site green power generation partners who’ve been recently recognized for their clean power usage. Overall MU placed sixth, outranking large corporations like BMW, IKEA and Coca-Cola. Additionally, MU is only one of four universities nationwide to even make the list. The University of California ranked fifth, Michigan State University placed 21st and the University of Iowa came in 26th. Wind energy – Made possible through a Power Purchase Agreement between MU and the City of Columbia. 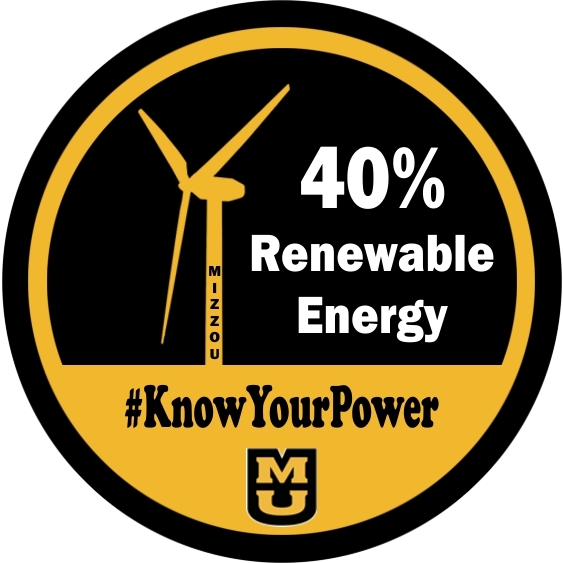 By utilizing the renewable energy sources listed above, MU’s annual on-site green power usage in the 2018 fiscal year was approximately 70.5 million kWh making up roughly 40 percent of the energy produced campus-wide. Additionally, while increasing its renewable energy use, MU has seen a 73 percent reduction in coal use. Over the last 10 years MU has reduced its greenhouse gas emissions by over 50 percent. In the years to come, Coffin said he projects the campus will only continue to expand its renewable energy use portfolio and grow its eco-friendly practices. Table 1. For a complete list of the Green Power Partnership’s Top 30 On-Site Generation visit the EPA’s website here.